A Southern New England builder of custom boats is ready to share its homegrown creations with a wider audience. North Rip Custom Sportfishing Boats will increase production beginning with a new 20-foot center console. The other partner in North Rip is Kyle’s brother, designer Daryl Wilbur. Kyle, 38, handles sales and marketing. He has technical sales experience and a marine technology degree from the University of Rhode Island. “[Daryl] basically does everything else; he doesn’t like the business part,” Kyle Wilbur says. Both brothers are known to get their hands dirty making each boat right. “We take everything from thought, from idea, to the finished product,” says Kyle Wilbur. Daryl, 36, manages production. He has been employed by Hinckley Yachts and worked under renowned designer Ted Hood, and has 17 years of experience in the marine industry. The North Rip 20 has a sweeping, flared bow and a curved sheer line. Kyle Wilbur says its running sheer, or ratio of sheer line to the bow flare, gives the boat its good looks, and is an example of the marriage of form and function. Wilbur says it took about a year to complete the tooling and molds for the 20. The brothers started the company a little over two years ago. The boat is popped out of a three-piece mold and the five-person crew builds it with wood-free closed-cell sandwich hull construction, an FRP-encapsulated stringer system, and foam sandwich deck construction. The company does its homework studying weight and stability, too. The center of balance and center of gravity are co-located, with the fuel tank over the center of gravity. “And believe me, from a manufacturing standpoint that’s not the easiest place to put the tanks,” Wilbur says. The 20 rides a deep-vee hull with strakes, and has tumblehome aft. 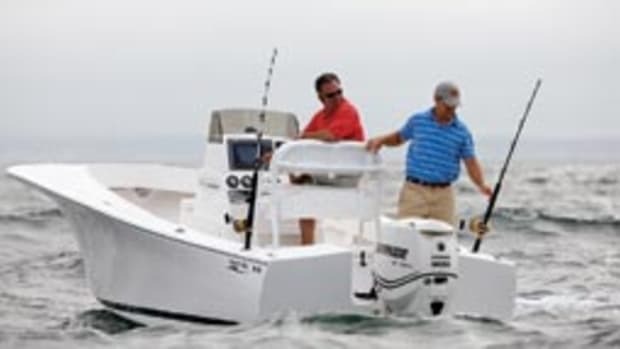 The boat is built around fishing, and that begins with modeling the ergonomics on a computer to ensure a 6-foot person with a 6-foot pole can fish 360 degrees around the boat. The transom area is designed to be clean and uncluttered, and the company specially designs its scuppers in concert with the pitch of the deck and wide gutters to be sure fish bones, debris, pieces of line and blood go over the side, away from the angler’s feet. Baitwell placement also is key, Wilbur says. “If I’m striper fishing, I don’t like to crawl around on my knees looking for an eel at 1 o’clock in the morning,” he says. The company designs and fabricates all but the aluminum and stainless steel components in-house, Wilbur says. 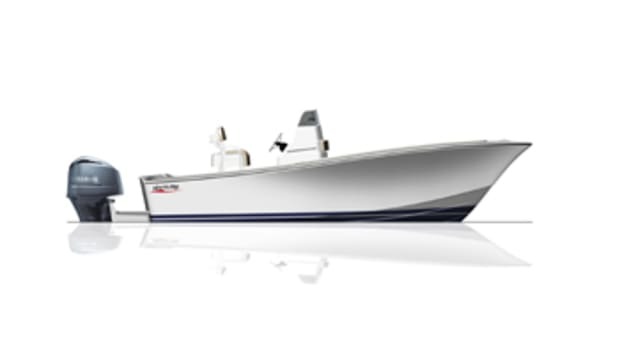 The 20 is available with outboard, or gas or diesel sterndrive power. “We’re very proud of it,” he says. One tradeoff is the boats are quite expensive, he says. The standard North Rip 20 sells for $48,000 ($52,800 with boat, motor and trailer), and the forthcoming North Rip 27 will be priced from $150,000 to $170,000. Efficiencies will come with growth and perhaps make North Rips more price-competitive, Wilbur says. He says North Rip is building quite a few center consoles as megayacht tenders. The company is in the process of moving from Rhode Island to a larger facility in Fall River, Mass.